An estimated 20 million people globally acquired hepatitis B virus (HBV) infections from unsafe medical injections in one year. Bloodborne Pathogens (BBP) are viruses carried in human blood and other body fluids that cause disease in people. There are many different bloodborne pathogens, including malaria and syphilis, but the human immunodeficiency virus (HIV), hepatitis B (HBV), and hepatitis C (HCV) viruses, which can each lead to liver cancer, pose the most serious threat of workplace exposure. Perhaps no other profession is more at risk of the hazards posed by bloodborne pathogens (BBP) than the medical profession, but that’s not to say that awareness and prevention measures shouldn’t be prevalent in all workplaces, because the price of ignorance can be very costly and simple understanding of some bloodborne pathogen basics, really can save lives. The primary means of transmission is through unprotected sexual contact with an infected person, sharing contaminated needles or syringes, transfusions from infected blood, and contact with open sores or wounds of an infected person. Infected mothers can also transmit these diseases to their babies during pregnancy, birth, or breastfeeding. Treat all blood and body fluids as if they were infected. The primary prevention tool against hepatitis B is vaccination before and after any exposure. For mitigating potential exposure hazards to bloodborne pathogens (BBP), the most desirable approach is to implement engineering controls that minimize or eliminate exposure to a risk at its source, such as phyiscal barriers which can include sharps containers, biological safety cabinets that lock, self-sheathing needles, and containers specifically designed and labeled with color coding that identifies them as contaminated waste. Practice controls is another line of defense from spreading bloodborne pathogens (BBP). Making folks wash their hands following an exposure incident or mandatory use of an appropriate antiseptic if there is no hand wash facility, are examples of work practice controls. Proper Personal Protective Equipment (PPE) is another line of defense from exposure. This can include disposable gloves, masks, and eye protection such as goggles or glasses with side shields, and face shields. Most companies with occupational exposure furnish biohazard spill cleanup kits, or should be doing so to minimize risk—if that isn’t the case where you work, you might consider checking into it. Some standard first aid kits now include disposable one-way resuscitation mouth pieces because in an emergency scenario where Cardiopulmonary Resuscitation CPR is required, people act fast and often without recognizing the risk of bloodborne pathogens. If blood is present during a first aid response, the responder should use the appropriate personal protective equipment to prevent direct contact with blood. Always wear disposable gloves whenever there is a potential for exposure to blood, body fluids, or other potentially infectious materials. Keep cuts and/or sores covered. Wash hands or other affected body parts anytime there is contact with blood or body fluids, or other potentially infections materials. Even if there’s a shred of doubt about exposure, scrub the suspect area. Dispose of needles in puncture and leak proof, medical hazard containers, and disinfect surfaces visibly soiled with blood or body fluids. 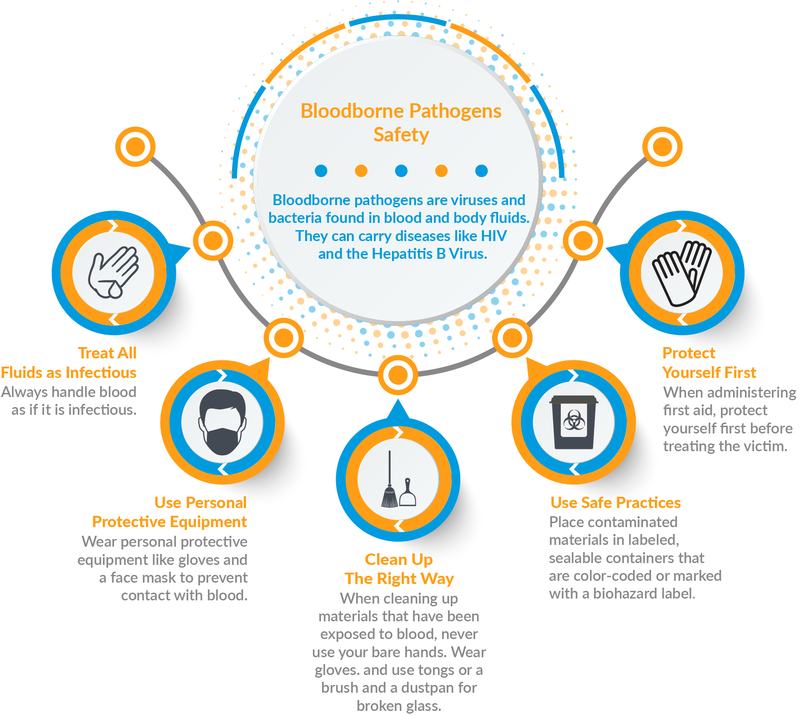 This infographic outlines five steps to safely handling accidents involving blood and other body fluids, so you can avoid exposure to bloodborne pathogens while providing first aid.